So… things have been a bit hectic around here. I had to change my day job at three weeks notice, which was exciting. While I haven’t been communicating much I have been working on Wanderer book 5. As well as writing 16,000 words I’ve completely outlined the rest of the book. That’s actually unusual for me, but with so many existing threads (and some new ones) to draw together it was really needed. I’ve found a great balance between locking down all the major ideas and events but still leaving space for the story to grow organically. The major themes are locked in (but may evolve) but the story is still exciting to write. In other news, the Wanderer’s Escape audiobook has now been out for a little over a month and already has 139 sales. Joel did an amazing job and great reviews are coming in already. In case you missed it, not only can you win a copy of the audiobook you can also buy it for a massive discount. See this blog for details. Glad to see progress on #5. Can’t wait !!! Tried to get the audio book but I guess I need to remove the original Wanderers Escape in order to be able to get the audio. When I try to get it I am told I already have the book and that is as far as I can get. If you’ve already got the ebook then you should just be able to go to the amazon page for it and choose the audiobook directly for $1.99 – let me know if that doesn’t work and I’ll dig into it. keep up the good work. It’s hard waiting for book 5. I know how much I hate waiting for new books, it’s really hard being on the other side. Sometimes it seems progress is so slow but my new plan of writing at least 500 words per day every weekday and over the weekend is helping to keep me at it. Having worked out the main plot is making things much easier too, a lot less stuffing up my head and a lot more space to just write the current scene as well as I can! 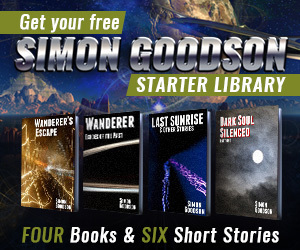 Read all four books of the Wanderer. All are most excellent. I’m looking forward to book 5. Hopefully you’ll give us a hint of Teeko’s origin. That could be another book.